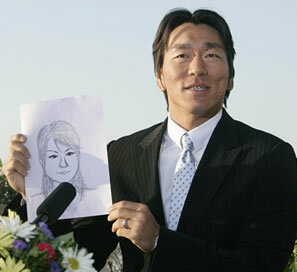 Hideki Matsui was born on June 6, 1974 in Japan’s Ishikawa Prefect. (Click here for a complete listing of today’s sports birthdays.) He began playing baseball when he was three, with his father. Later, he excelled at the sport in elementary school, where he and his classmates used a rubber-coated ball on the playground. Hideki joined his first organized team at age 10. By that time, he was already very focused on baseball. While other children embraced a number of sports—most notably soccer—Hideki confined his athletic interests to the diamond. He studied judo, but mostly to sharpen his reflexes. As a child, Hideki rarely played a baseball game in which he was not the best player on the field. He found the infield to his liking, settling in at third base. His quick hands, sure glove and strong arm made him a natural at the hot corner. Hideki developed into an excellent hitter with good power. His batting style was unusual for a slugger. He stood straight up, bending neither his knees nor his back. His erect stance served the function of slowing down his swing, which was extremely fast through the hitting zone. Although Hideki almost seemed to be fighting himself at the plate, no one quarreled with the final results. Hideki was a fan of the Hanshin Tigers of the Japanese Central League. Their third baseman, Masayuki Kakefu, was one of Japan’s most beloved players. The Tigers did not have very good teams, but they were a lot of fun to watch. When Hideki was a kid, Hanshin signed Randy Bass, an ex-Major Leaguer who became a prodigious slugger in Japan. The Tigers also had Cecil Fielder, before he returned to the United States and produced back-to-back 50-homer seasons in Detroit. Hideki found the longball hitters mesmerizing. Soon he was smashing long, high home runs himself. No user commented in " Hideki Matsui "